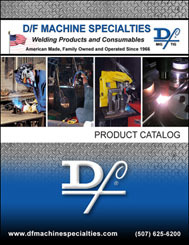 D/F MACHINE SPECIALTIES - American Made MIG & TIG Welding Guns and Welding Consumables. Request a FREE copy of the NEW D/F Product Catalog. Click here! DOWNLOAD the digital version of the catalog. Click here! D/F MACHINE SPECIALTIES is a family-owned and operated company that has been committed to producing American made welding products with American made materials for the last 45 years, and has been the innovator of all of its products. Quality and service are surpassed by no one. This attention to detail transfers to the customers receiving the finest welding products available on the market today. D/F's MIG (Gas Metal Arc Welding) & TIG (Gas Tungsten Arc Welding) torches have been used exclusively with welding automation equipment by Lincoln Electric, Miller Electric, Linde/ESAB, Victor, Thermadyne, Thermal Arc, Pandjiris, Bug-O Systems, Ogden Welding Systems, and Welding Alloys for over 45 years. 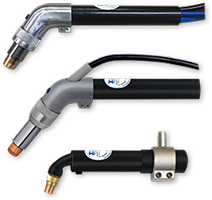 For hard automation, high deposition, and large wire diameters that require preheat and high amperages, a D/F heavy duty water-cooled weld automation torch is ideal for wear resistance and has been used for open arc mechanized cladding applications for multi-surfacing and rebuilding applications, metal build up, hardfacing, hardbanding and metal spray applications. D/F is a leading provider of welding guns and welding torches for aluminum trailer manufacturing and heavy steel fabrication in a wide range of industries, ideal for single-head overlay machines or multiple-head machines used with hardfacing and pipe forming applications. 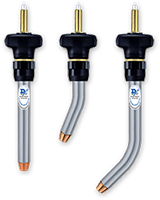 D/F Machine Specialties genuine American torch tips and nozzles deliver the performance and reliability you need to minimize your production costs while maximizing welding efficiencies for your automated welding systems! Since the inception of robots in welding, D/F's robotic torches have been used on all robotic manufacturers' equipment including Fanuc, ABB, Motoman and Panasonic robots. D/F is a lifelong member of the AWS (American Welding Society), and has had MIG and TIG innovations consistently featured in the Welding Journal. Whatever manufacturing industry you are in - whether automotive, aerospace, agriculture, construction, fabrication, railroad or cryogenics; whether you use MIG, TIG, Air Cooled or Water Cooled, hand held, fixed automation or robotics; whether your job is aluminum, steel, stainless steel, hard, cored, flux cored, stellite or inconel wire - we are ready to help with your welding applications.